do you have to be jewish to eat beef tongue? 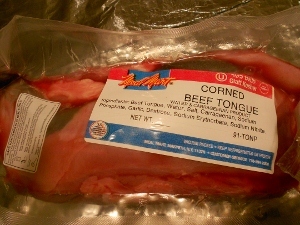 Tongue has been a delicacy in our home ever since I can remember. Naturally, it wasn’t an everyday indulgence but you could count on being served tongue in apricot sauce on any given Yom Tov (Holiday). It was with great interest then, that my sister told me about a recent episode of “Chopped” she had witnessed while waiting at the doctor’s office. “Chopped” is a Food Network show, where 4 chefs compete to make an appetizer, entree, and dessert, within a 20 minute time frame (for each course), with specific items given to them in a basket. (They “chop” one chef after each course, leaving one winner at the end.) Naturally they don’t know in advance which foods will be in their baskets. For the appetizer on this episode, the chefs were each given a cooked pickled beef tongue along with 2 or 3 other ingredients. I was shocked to hear that none of these self made or trained restaurant chefs knew what to do with the tongue! 3 of the chefs chopped it up (skin on) and threw it into a salad, and the 4th chef knew that he had to peel it but had no clue how, and he proceeded to stand up the tongue and peel it like a pineapple! Needless to say, he was just left with the center of the tongue…..
By contrast, tongue can be found on the menu of any given Kosher or “Kosher-style” deli. 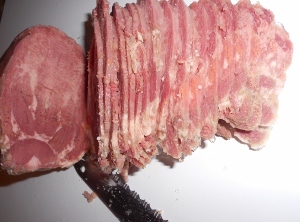 Be it in a sandwich or by the pound, tongue is the most expensive deli meat on the board. 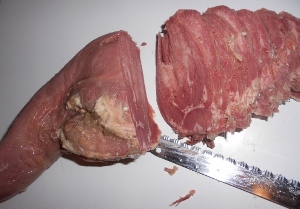 A raw pickled tongue can cost approximately $12/lb, and cooked tongue will set you back $26/lb or more. 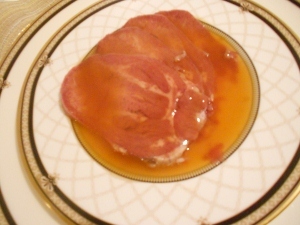 Tongue is delicious served in a sweet apricot sauce, but my family prefers it plain and warm with a bit of mustard. Alternatively, I put a few warm slices of tongue on top of a salad dressed with a honey dijon sauce. 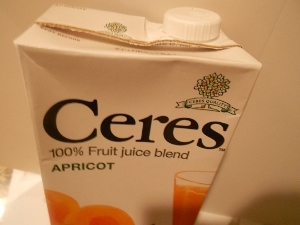 Remove tongue from sealed package and rinse with cold water. Place in a large pot and completely cover with water. Cook on medium to medium-high heat for 3 hours, changing the water after 1 1/2 hours. Let tongue cool for about 1 hour. Remove from water and peel the tough outer skin layer with your fingers. It should peel off easily. Let cool completely before slicing. The thinner the slices you cut, the more delectable your dish will be. This recipe is the one I’ve been using all the years. It is from The Spice and Spirit of Kosher Jewish Cooking, volume 1, cookbook. 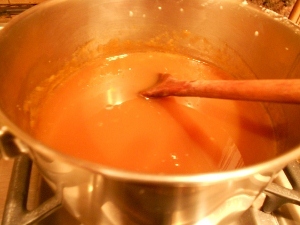 Approximately 30 minutes before serving, warm sauce ingredients in a pot and bring to a boil. Stir in as many slices of tongue as you are going to serve. Shut off flame, and let tongue warm in the sauce for a few minutes. I usually serve a slice of sweet and pepper lukshin (noodle) kugel alongside the tongue. It goes very well with the apricot sauce and the textures contrast nicely. we think this blog is wonderful and very interesting. thank you for posting such yummy recipes for us to enjoy. looking forward to more yummy tasting foods soon. have a lovely Rosh Hashana and enjoy all your yummy recipes. Haven’t tried this yet, but do agree that pickled tongue, done right, is delectable. 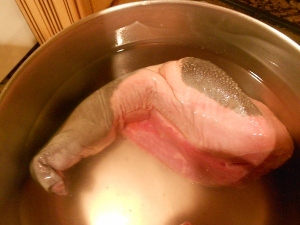 My question is : with so much pre washing of the raw pickled tongue (that’s actually what the pre- cooking rinse and change of water mid cooking process amounts to) how can one prevent the tongue from losing its pickled taste? (I don’t particularly care for cooked tongue without the pickling spices.) Are fresh spices added at any time during the cooking process? I do not use any spices in the cooking process, only water. The cooking and changing the water helps in removing some of the saltiness of the meat that it gets during the pickling process. The taste of the pickled tongue is delectable, unlike cooked tongue which is bland. I haven’t bothered to change water as I doubt if it makes much difference when the skin is still on anyway. Also, as someone else pointed out, I do want the strong taste of the actual pickling spices. Mine is simmering on the hob at the moment! Unfortunately, have had to change plans at last minute and stay in UK for chag – and note that tongue here is twice the cost of tongue in Israel!